As I pointed out earlier today, the player in first place often has a huge edge heading into Day Two. Will Jennifer Giles take down the $100,000 prize? She’s got it alllllllllmost locked up. 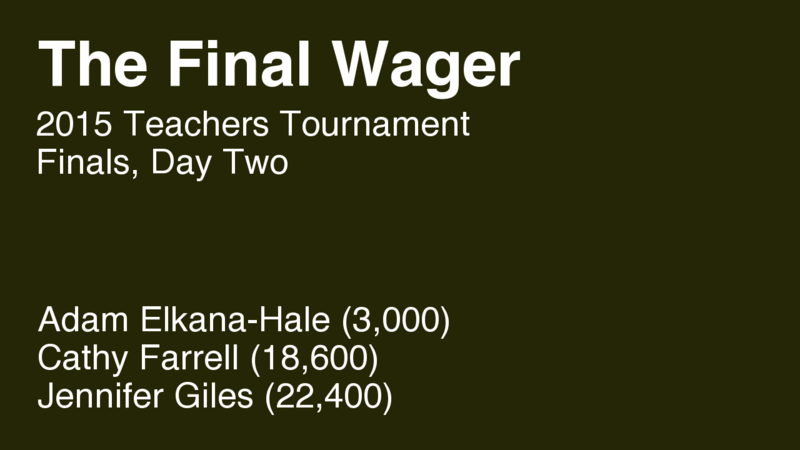 In keeping with our theme of this Teachers Tournament, the wagering is simple. Jennifer needs to wager 1,001 to cover Cathy. Cathy needs to get it right to have a shot, so she might as well wager everything. Adam needs to get it right to have a shot at second, so he might as well wager everything. Congrats to Jennifer, who will return for the next Tournament of Champions! Jennifer’s wager probably deserves a lower grade, because if Cathy were to wager small enough to guarantee second place (which since winning is the goal she shouldn’t do, but it is a possibility) it unnecessarily gives Cathy a chance to win with the keep-Adam-locked-out bet. Hard clue, took me some thinking and I got the clue.